The issue of pipelines is a key in Canada's latest crossroads of national seriousness. The country didn't arise from an anti-colonial revolution, like others in the Americas, or from a unique cultural homogeneity like Norwegians, Finns, Israelis and Czechs. It was a group of British-settled or occupied territories strung along the American border and hastily put together when the U.S. emerged united at last and with the greatest army and generals in the world after its Civil War, and unencumbered with any affection for the British Empire. John A. Macdonald, the great and racially tolerant founder of the country, and George-Étienne Cartier and George Brown, conceived the only transcontinental, bicultural, parliamentary confederation in the history of the world, and secured its approval by squabbling colonial legislators in what are now four provinces (Ontario, Quebec, Nova Scotia and New Brunswick), and by the British Parliament. Benjamin Disraeli was chancellor of the Exchequer, deputy prime minister and leader of the House of Commons in a government officially led by the Earl of Derby, who as colonial secretary had completely misjudged the issue of responsible government in Canada after the 1837 rebellion. Disraeli and William Ewart Gladstone, in the midst of their great rivalry of more than 35 years (during which they served as prime minister and chancellor a total of 13 times) had little knowledge of Canada, were skeptical about its survival, and Gladstone generally thought the Empire was nonsense anyway. They interrupted the intense debate over the Second Reform Bill, vastly expanding the British electorate, to put Macdonald's British North America Act through. The colonial secretary, Lord Carnarvon, said they were creating what would eventually be one of the world's great nations, and the governor general of Canada, Viscount Monck, spoke in the House of Lords in support of it with some eloquence. Macdonald was nominated and elected the first prime minister but realized the new country needed a national purpose beyond not being American. He soon unveiled his "national policy," which consisted of setting up more provinces, imposing a tariff that would facilitate the creation of a manufacturing industry, and most ambitiously, building a transcontinental railway that would connect the new country and be the spine of it. This was an immense undertaking: the Americans were pursuing the same objectives but they could lay track on farmland and gentle hills all the way to the Rocky Mountains and had a huge capital market to finance their railways. Canadian Pacific was largely built upon the rock of the Canadian Shield, and Canadian financial markets could finance only about a quarter of the costs. The financial centres of New York and London, where funds would have to be raised, were heavily influenced by forces connected to competing American railroads. Macdonald got his entire program through, and was followed by 15 years of Wilfrid Laurier extending rail service in the country and incentivizing immense waves of immigration. Macdonald and Laurier, prime ministers for 34 of Canada's first 44 years as a Dominion (there were five prime ministers in the other 10 years), built a credible country, able to play an important and distinguished part in the First World War. Other prime ministers were more than placemen. Robert Borden took the country through the First World War (though he used the English majority to impose conscription on French Canada). Mackenzie King ran always as a figure of French-English conciliation, and got the country through the Second World War without a major split, running a very distinguished war effort, and even taking the lead in urging president Harry Truman and British prime minister Clement Attlee into the Cold War after the Igor Gouzenko affair broke in Canada in 1946. Louis St. Laurent presided over peace and prosperity in the Fifties, Lester Pearson was a wide-ranging reformer. The only reason Pierre Trudeau entered pubic life was to defeat the Quebec separatists, and he did it when no one else could. Brian Mulroney tried unsuccessfully to complete the constitutional process but did succeed in putting through free trade and in moving the basis of federal income from taxes on income to taxes on goods and services, both vital achievements. Jean Chrétien and Paul Martin eliminated the federal deficit and passed the Clarity Act, making provincial secession more complicated after almost losing the 1995 Quebec independence referendum. Stephen Harper tried to shrink the public sector durably by reducing HST. Other leaders governed too briefly to leave much of a mark. For two-and-a-half years, the Justin Trudeau government has been preoccupied with full-body immersion in politically correct pandering to native people, gender warriors, and eco-alarmists, in fiscal extravagance, collective apologies, and Peter Pan posturing in the world. In strategic terms, Canada is a mockery for importing 700,000 barrels of oil a day in eastern Canada while being unable to move oil from Alberta to eastern markets. The accomplished financier and philanthropist Seymour Schulich last week sent round a letter to a Vancouver newspaper from a man in Seattle thanking Canada for the gift of "$100 million a day" because of the low oil price forced on Alberta by British Columbia, by preventing Alberta from exporting oil to world markets. The failure to supply our eastern provinces and to access fully the trans-Pacific markets, squabbling and envious provinces, and the lack of any effective federal leadership are a disgrace that makes Canada appear completely dysfunctional; a chump among the world's nations we so tiresomely lecture on their moral duties. I like Justin Trudeau personally and urged readers to vote for him in 2015, because of the Harper autocracy and sclerosis (after a generally successful period as prime minister). While the financially and oratorically extravagant political correctness of the government is grating, there have not been disasters until recently. Failure to get some movement on pipelines will sink this government. The stalling of the Kinder Morgan Trans Mountain pipeline expansion, which would almost triple the flow of Alberta crude oil to the West Coast, to 890,000 barrels daily, and the cancellation of the Energy East pipeline in October of last year, which would have brought more than a million barrels a day east from Alberta and Saskatchewan for refinement and sale or export, are both traceable to the absence of federal leadership. Underlying the travails of both projects is the moral incapacity to face down the nativist and ecological scaremongers. 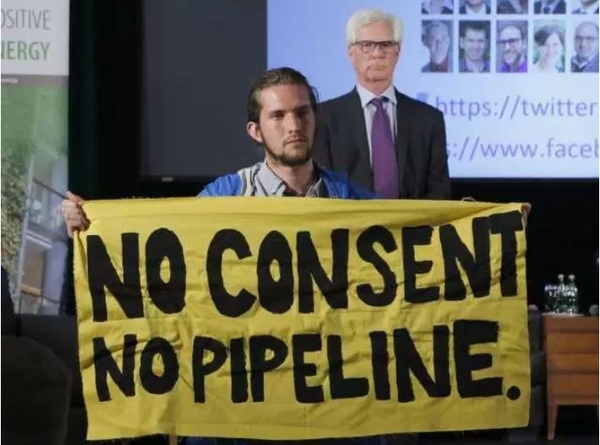 The natives are ambiguously divided on the Trans Mountain pipeline and do not play an important role in the eastern project. And the climatic debate is nonsense: alleged (completely implausible) danger to 76 orca whales on the southern British Columbia coast, and esoteric discussion about the impact on ability to meet the insane carbon-emission targets we foolishly committed to in the Paris climate agreement. (It doesn't matter much because the entire fairy tale evaporated with the withdrawal of the United States, while the chief offenders, China and India, charge ahead making no commitment to do anything.) We will find out soon enough if climate is changing, if the world is warming, and if the conduct of man has anything to do with any of it. We need not amuse the world by pre-emptively punishing ourselves as we are. What is required is a federal enunciation of a right of eminent domain that enables the federal government to fulfill its mandate to provide peace, order and good government. This could require the patient appointment of high court judges who will not be as easily gulled as they have been recently by woeful tales of the ubiquity and fragility of native religion and the susceptibility of nature to the safest of all energy transmission methods. And above all, it will require leadership. It's showtime for Justin Trudeau; to take a phrase from the Quebec of Pierre Trudeau's politically formative years: "Un chef ou pas un chef?" (a leader or no leader? ).